Provide comfort for the family of Murray Rose with a meaningful gesture of sympathy. 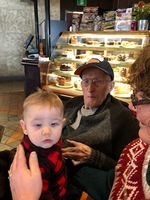 ROSE, Murray Beverley – Passed away peacefully at Chartwell Aurora on March 19, 2019 in his 98th year. Loving husband of Margaret Beatrice Marie Rose (Smith). Beloved father of Julia (late Mike), Gerry (Kathy), Bob (Darlene) and the late Allen (Susan). Proud grandfather of Elaine, Allen, Annette, Wayne, Angie, Jeremy, Kaylene, Amanda, Lindsay and Steven. Great grandfather of 14. Brother of Kathlene Rutherford and twin Charlotte “Lottie” Rose. Son of the late Stanley and Alma (Watson). Murray was born in Mimico and raised near Schomberg. 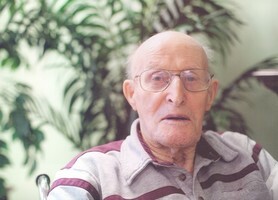 He was a farmer and enjoyed boating and gardening. 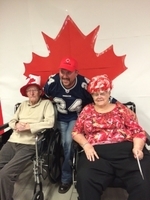 Special thanks to the caring staff at Chartwell Aurora. 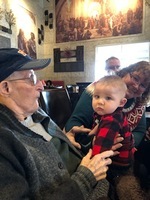 Friends may call at the Roadhouse & Rose Funeral Home, 157 Main Street S, Newmarket on Friday, March 22, 2019 from 7-9 p.m. and Saturday, March 23, 2019 from 10-11 a.m. Funeral service in the chapel at 11 a.m. Interment will be at Laurel Hill Cemetery, 149 Centennial Drive, Caledon. If desired, memorial donations may be made to the Alzheimer Society. To send flowers in memory of Murray Beverley Rose, please visit our Heartfelt Sympathies Store. We encourage you to share your most beloved memories of Murray here, so that the family and other loved ones can always see it. You can upload cherished photographs, or share your favorite stories, and can even comment on those shared by others.